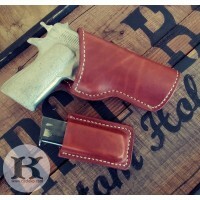 Looking for great fitting, extremely durable and handsome leather holsters and gun belts for your Single Action revolvers? 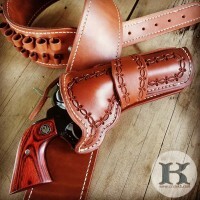 At Circle KB Holsters we take pride in making the highest quality western style holsters and hunting belts, shoulder holsters and rifle slings built to your specifications and desires - totally custom. For over 20 years, Brett's benchmade-to-order western holsters have risen in popularity and demand among Collectors, Hunters and Guides, Cowboy Action Shooting sport enthusiasts, Single Action Shooting Society (tm) SASS members and working cowboys and ranchers worldwide. When you place an order with Circle KB you can expect high quality craftsmanship, high quality materials and high quality customer service. It is our everyday mission. If you do not see the style of finish you are looking for please give us a call. Brett makes truly one-of-a-kinds based on your requests and is available to answer your questions and offer consultation. We know you want your order faster than a speeding bullet so we process and ship orders around the world 6 days a week. Orders are made in the order we receive them. Please plan ahead as Brett is considered one of the best western leather holster makers in the country and stays busy on his bench. Thank you and we appreciate being your Maker of Choice. If you have any questions please don't hesitate to call or email. Owners-Brett and Kris Park, Circle KB Western Cowboy Holsters - Corvallis, Montana. 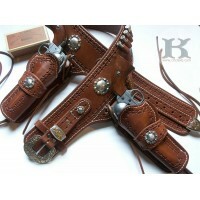 The Big Game Hunter CrossDraw Holster and Gun Belt is a western style hunting holster, hand carved from premium Grade ..